At Offbeat Bride we believe wedding hair isn't just about updos and tiaras (although we love those too!). We believe it can be about bold colors, short styles, and even no hair at all! 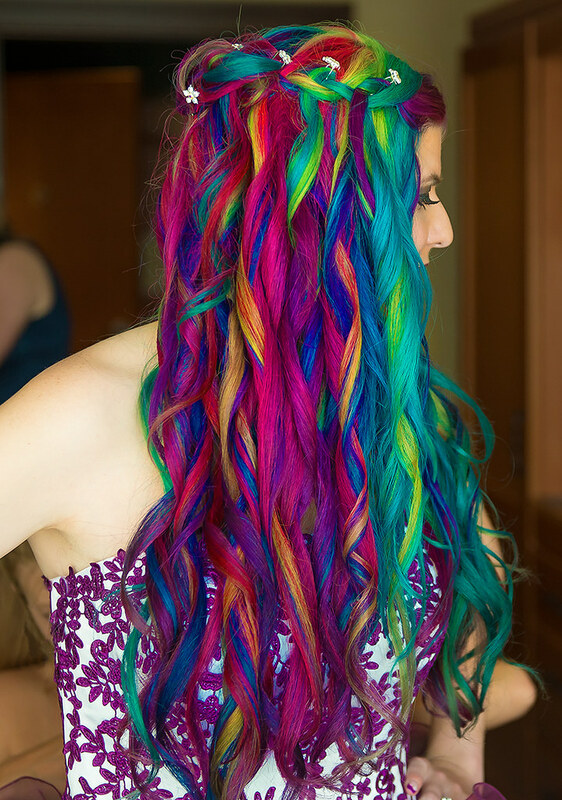 Oh man, we have featured brides and grooms with hair almost every color of the rainbow, and in some cases, ALL colors of the rainbow! Of course we love all our long-haired femmes and short-haired men-types, but we also love celebrate the offbeat hair lengths you don't see as frequently in wedding media. Natural Black hairstyles: the bigger the better! Masculine hair for grooms, transfolk, and non-binary people of all identities! Ok, so sometimes you just need ideas for wedding updos and hairstyles. We've got a ton! You'll find SO many more creative wedding hair styles right here.